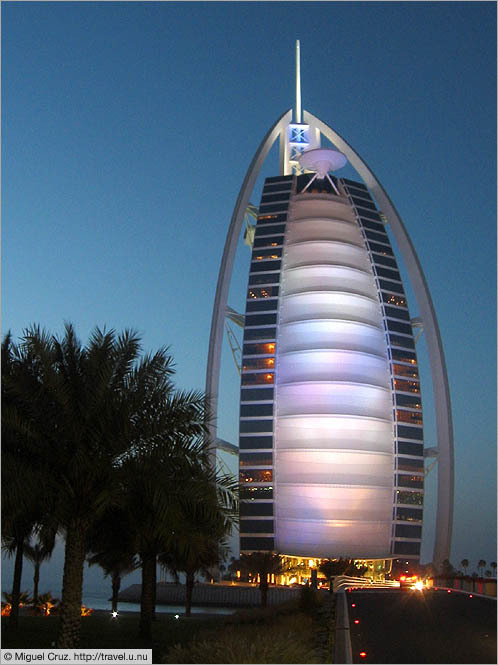 Burj al-Arab ("Arab Tower") claims to be the world's only seven-star hotel. It's also the world's tallest operating hotel, eclipsed only by the unfinished (and pointless) Ryugyong Hotel in Pyongyang, North Korea. It's hard to tell from the photo, but the building is actually taller than the Chrysler Building in New York City. I couldn't get any closer than this, because my attire wasn't sufficiently fancy to pass the dress code (my T-shirt and sneakers failed to impress the guards at the main gate).